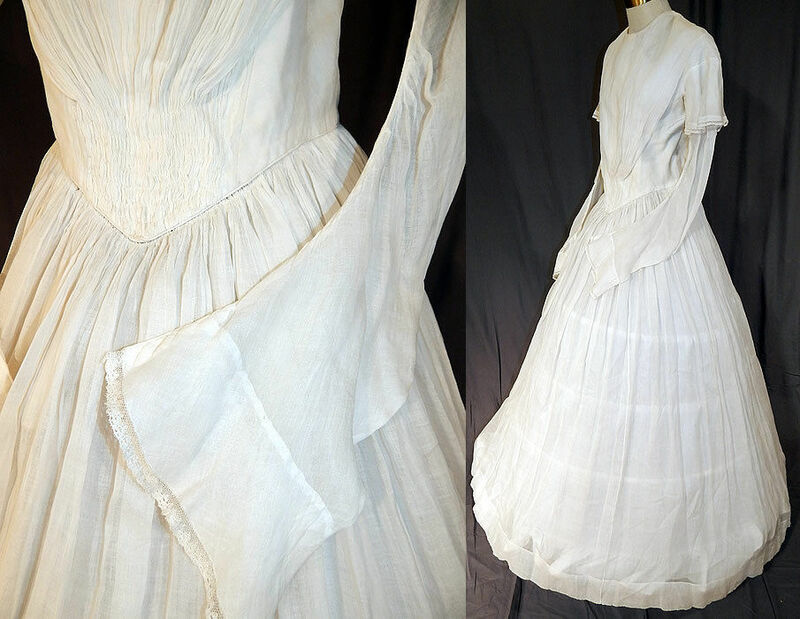 This antique Victorian era white muslin hoop skirt wedding gown dress dates from the 1840s. 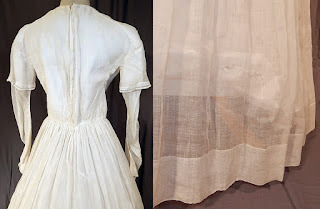 It is made of a light weight woven fine sheer white muslin fabric. This early bridal wedding gown dress has long layered tiered tapered sleeves with a flared laced cuff under sleeve, a triangle shape bodice top with gathered cartridge pleats V point fitted waist, long full hoop skirt (hoop not included underneath), brass hook closures down the back and only the top is lined. The dress measures 57 inches long, with a 26 inch waist, 34 inch bust and 24 inch long sleeves. 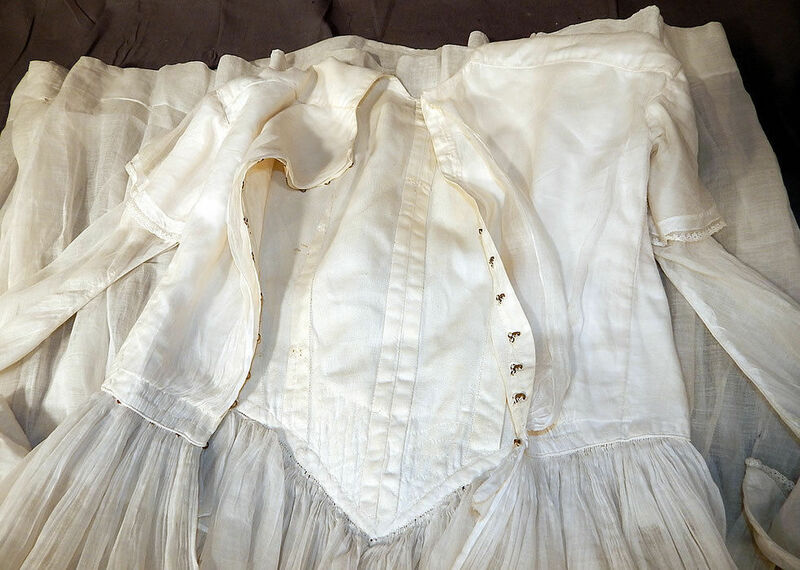 It is in good as-is condition, with a patched mended repair under one arm, a few small frayed holes and repairs on the skirt (see close-ups). This would be perfect for display or design and is truly a rare and wonderful piece of early bridal Victoriana textile art! White does not mean bridal! 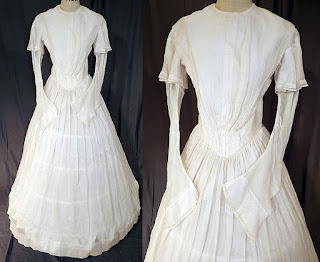 Queen Victorian only started that tradition maybe a decade, if that, before this dress was fashionable. In Catholicism, blue was still being worn or any nice silk dress. It's the reason we still say "something blue" for the wedding - it's in honor of the Virgin Mary. 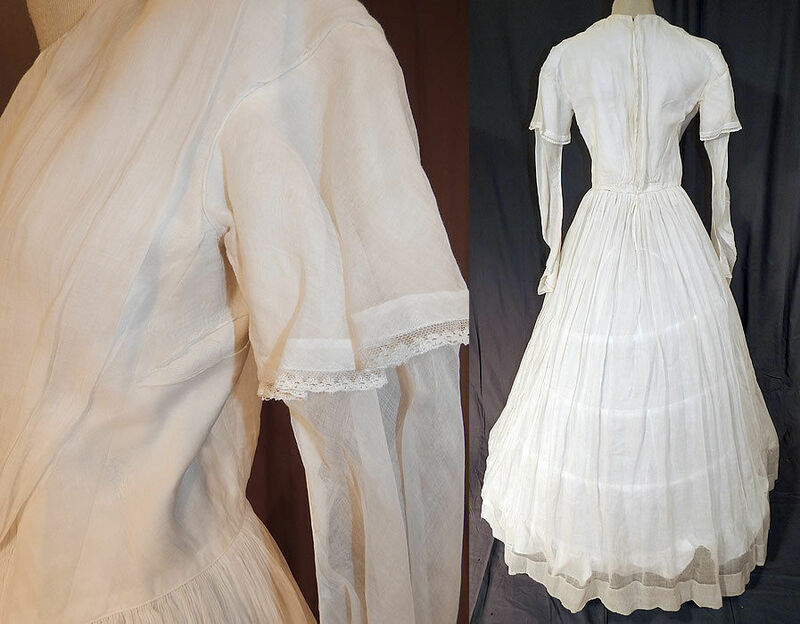 This fan front summer dress is just a nice 1840's dress.